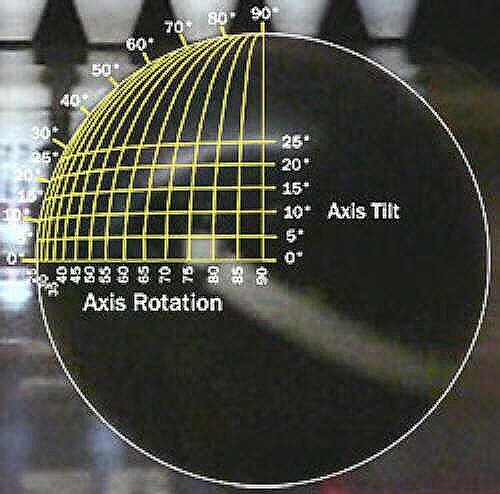 Axis tilt: Angle between axis of rotation and the horizontal plane - caused by the bowler at the release, represents an angle of the axis rotation above a horizontal line through the middle of the ball. Axis tilt represents the vertical alignment of the hand at release. Tilt is changed by the position of the wrist. By positioning the wrist left or right during the swing of the ball, the position of the thumb and fingers change the angle of the fingers during the release. 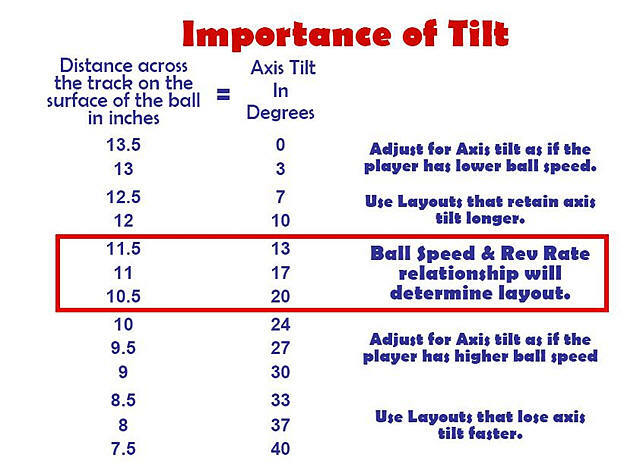 Ball spin is the result of axis tilt. The higher the axis tilts, the more the ball spins, and the resultant path of the ball is extended. As the ball is released, the fingers cause the ball to rotate around to the ball's vertical axis. This is seen as ball spin. Most bowlers, during their release, have some tilt. The degree of tilt can be viewed and measured as the circumference of the ball track. Axis tilt is the distance from one side of the track to the other on the negative side of the ball. This distance is converted into degrees using an axis tilt chart. The more axis tilt, the less the resultant hook. Should axis tilt become equal to axis rotation, the ball will not hook. In order for the ball to hook, axis rotation must always be greater than axis tilt. The axis of rotation defines how far the axis rotates from a pure forward roll in the horizontal direction. The axis tilt defines how far the top of the ball is above the middle of the ball, and is measured in degrees. Axis tilt promotes skid. The more axis tilt a ball has, the later the ball transitions into a roll. The less axis tilt a ball has, the sooner the ball transitions into a roll. Spin in the vertical field affects accuracy. The more the ball spins, the more difficult accuracy is. A broad guide is provided for your consideration. Low Tilt Less than 11° The advantage of low tilt may suffer and the ball may turn too early. Lower axis tilt requires longer drillings, and a pin placement that RETAINS that tilt. Longer drillings allow the ball to avoid losing energy too early and hitting like a wet noodle. Average Tilt 12° - 16° The advantage of low tilt are that more surface touches the lane per revolution, this makes the ball start up a little earlier, and react a little smoother typically. High Tilt 17° - 24° The advantage of higher tilt, is that less surface on the lane will get the ball down-lane easier and typically come off the spot harder. High axis tilt require shorter drillings. Very High Tilt More than 25° The ball turns very late, and may be advantageous for a very low ball speed. The goal is use layout and fit to make the effects of the tilt closer to those of the 13°-15° tilt range. 3 1/2° of tilt, is equal to about 1" of track diameter. There is much that goes into matching up the lanes conditions, ball and bowler. Using Axis Tilt is yet another tool in your bag of tools.